What Sets Oakland Harvesters Apart From The Rest? Aquatic Weed Harvester technology really hasn’t changed in 40 years. The same basic principles, functionality and designs of the equipment has remained largely unchanged. Our machines outperform brand new harvesters, due to years of experience and learning what upgrades are needed and what’s truly important on a harvester, but the real difference with Oakland Harvesters is speed and proficiency. Meet Green Lightning! Green Lightning (aka GL) is 34’ of weed hauling awesomeness! She holds 1000 cubic feet of harvested weeds and fully loaded will clip along at 15mph (7 times faster than a harvester). GL helps Oakland Harvesters employ our constant cutting methodology. Our harvesters cut non-stop which is conservatively 2-3 times more efficiently than our competition. They load their harvesters, then slowly chug back and forth to the offload site, wasting a considerable amount of time and resources (loaded harvesters move at about 2mph). If cutting mass amounts of Starry Stonewort, you can literally fill your harvester up in minutes and spend the majority of the day going back and forth to the offload site. We offload on the cutting grounds and basically cut non-stop. This means you’ll get a better result, less floating weeds, and we’ll be off your lake in half the time. 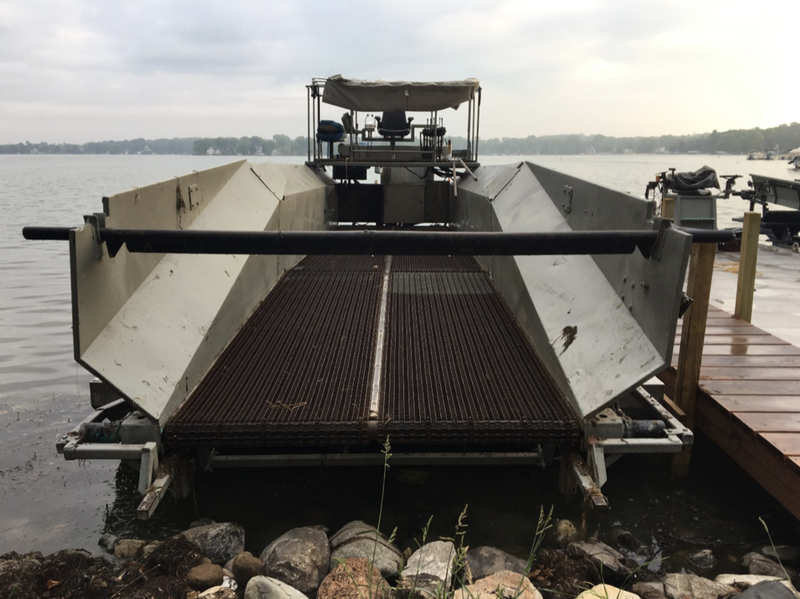 This will reduce environmental impact, risk and increase the usage of your lake during the harvesting season (which is basically the best time to be on the water in Michigan). We’ve also upgraded the most important parts on our harvesters to reduce breakage, increase performance, and perform better vs. standard stock variations. Years of trial and error, breaking and fixing things has been fruitful in developing the equipment and techniques that deliver the best performance and results. Our cutting heads have been upgraded with heavy guards, all metal brackets and clips (no plastic parts) which fit tighter, cut better which results in a better harvest and far less residual floating weeds. We utilize hi torque hydraulic drive motors for powerful operation in heavy weeds and Stonewort (no bogging down and having to stop). All things considered we feel we offer the best combination of efficiency and results available in the current market. Our goal is to come in and get you the maximum results in the least amount of time, and let you enjoy your Michigan summer on the water. Chemical Weed Control VS Mechanical Harvesting. When it comes to scientific management of a lakes aquatic weeds, sometimes chemicals are part of the problem and not the solution. We have found that a combination of chemical treatments and mechanical harvesting to be the most effective means to manage aquatic weeds and algae in Michigan lakes. The dreaded Starry Stonewort (invasive algae) thrives when you kill off the native and invasive weeds. Chemicals have little to no effect on it, then it thrives and spreads on the biomass created when existing weeds are eradicated. Starry Stonewort quickly spreads and literally fills in your lake from the bottom up. Ever pull up your anchor only to have it covered with a huge stinky mass of weed-like vegetation? That my friends is the enemy. The ONLY way to keep this algae at bay is to physically remove it from your lake. Oakland Harvesters specialize in starry stonewort removal among others. Our machinery and concepts will remove on average 2-4 times the amount of algae and weeds over the same time period vs. our competition. Invest your lake improvement monies where you achieve the maximum benefit. As a 17 year lakefront homeowner I’ve watched as year by year we lose more and more navigable water as the Stonewort literally fills in our lake. Expect winterkills of your fish population, as the oxygen content of the water is greatly diminished with the vast amounts of rotting biomass on the bottom of your lake. Chemical “burning” or “haircuts” do little to nothing and have almost no effect despite what you may have been told. As chemical treatments become more and more expensive, and lakefront homeowners are unhappy with the results of dumping deadly chemicals into the water where their families play. Mechanical harvesting is becoming more prevalent being safer, healthier and with greater results than chemicals alone. Cost analysis between the systems is similar, however with only chemical treatment you may be setting your lake up for a near irreversible future invasive takeover which will cost more long term as it gets a foothold in your waterways. No matter if it’s an overgrowth of native aquatic weeds or invasive, the only real answer has become introducing some mechanical harvesting. Don’t wait and lose your lake like so many already have.